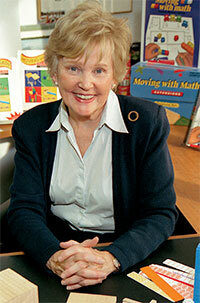 For over 40 years, Moving with Math has been providing successful educational math solutions for students, teachers and administrators. The heart of this success has been the steadfast commitment to using true concrete manipulatives with the Concrete-Representational-Abstract instructional methodology to develop conceptual understanding of essential objectives from Pre-Kindergarten through Algebra. 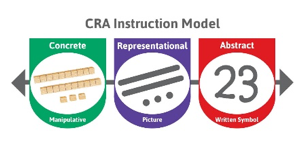 As students hold manipulatives in their hands, talk aloud and draw pictures, they develop an understanding of key concepts at the concrete level and are then guided to understand the abstract written symbols used to show math. As a former teacher, I understand the daily challenges of working with students who struggle with math. The Moving with Math Learning System provides the educational model for success while making the job of the teachers and administrators easier. Formative assessments, correlated to objectives, drive explicit instruction and progress monitoring and daily reviews help verify conceptual understanding and aid in long term retention. Easy-to-use Teacher Guides save time with comprehensive lesson plans and provide Professional Development every day with lightly scripted lessons highlighting the important steps in teaching with manipulatives. Teachers and students find success together developing understanding and raising achievement. Not only do we have a research based program that works, we are also fortunate to have highly trained Educational Consultants who are here to assist in all aspects of developing and implementing your RTI plans. Browse the website, and then give us a call to discuss your needs. All of us at Math Teachers Press look forward to working with you as we continue our quest to implement a better way to teach math—and reach more students than ever before.